I'm obsessed with summer colors. There are few things more inspiring to me than the rainbow of fruits and vegetables that fill the market shelves and produce stands this time of year. If a vegetable is sold in a color that it's not typically sold in (read: purple potatoes, multi-colored carrots, orange tomatoes)--I will probably buy it. 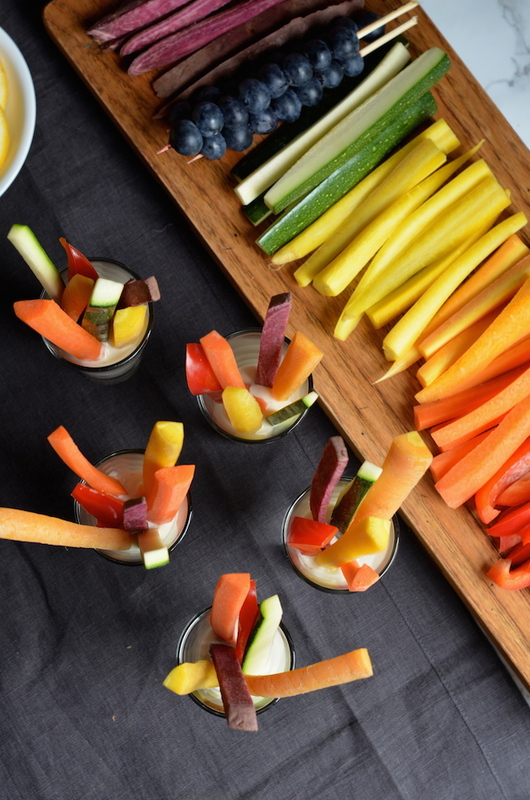 These Rainbow Veggie Dippers are a super quick little appetizer idea for your next summer party. Takes minutes to put together, but for some reason people go wild for them. 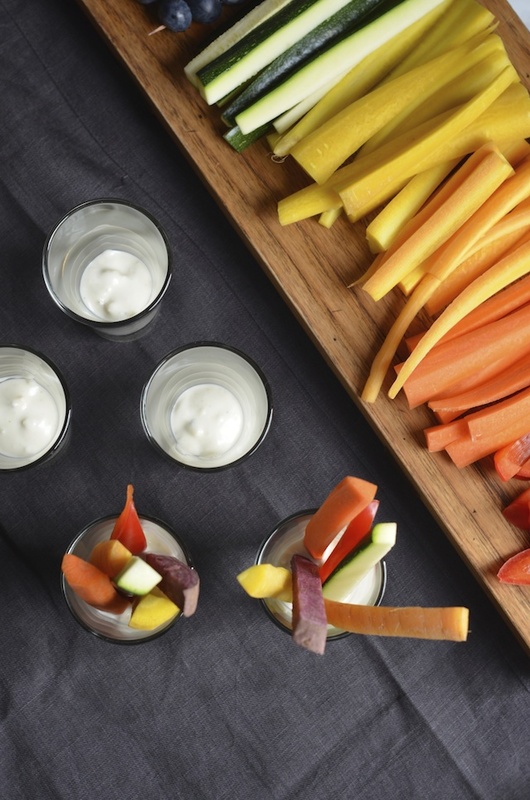 It's really just dip and crudites, but the trick is all in the presentation. Your favorite dip or dressing (I'm using blue cheese dressing here, but ranch or Caesar would work, too) is piped into the bottom of a shot glass. You can use a spoon, but a piping bag keeps it neat and prevents it from streaking down the side of the glass. Then all you have to do is layer in a rainbow of veggies in different colors. I used rainbow carrots, bell peppers, zucchini and roasted purple sweet potatoes for mine. Use whatever you have or love! Cucumbers, celery, radishes--anything that can be cut into a long-ish spear will work. 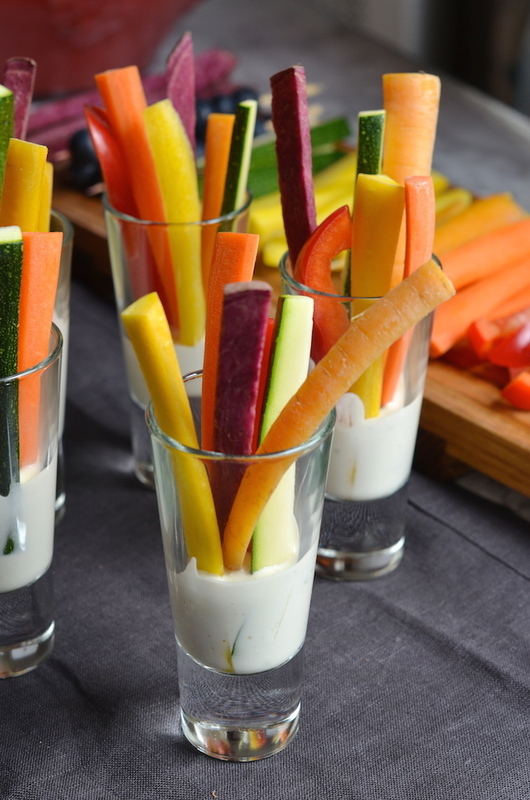 It's a fun and easy way for people to snack on veggies at cocktail parties. No need to worry about double-dipping! Place dressing into a piping bag, and pipe about 1 1/2 tablespoons into the base of each shot glass (use more or less depending on the size of your glass). 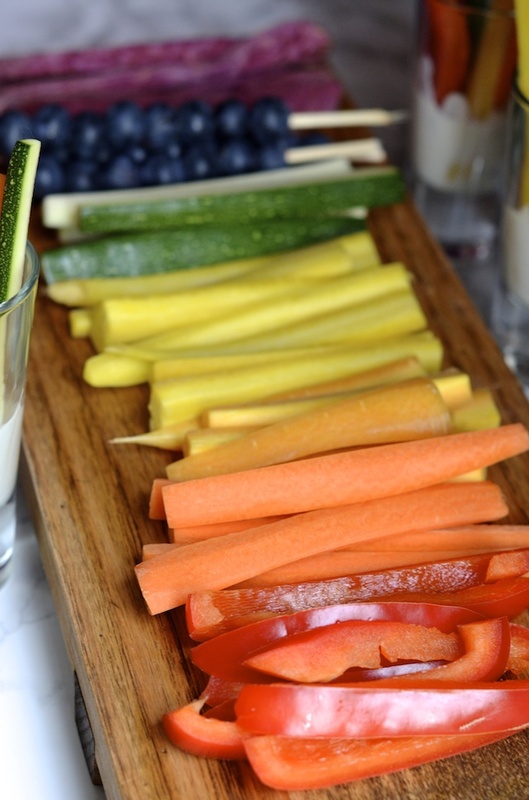 Layer in the veggie sticks. Serve immediately, or cover loosely with plastic wrap and chill until serving (up to 4 hours).